Today, I sat next to a sweet little girl, who goes by the name of Abbigail. If only I hated CAKE! This is my families favorite cake. We could all eat the frosting with spoons . . . without the CAKE! 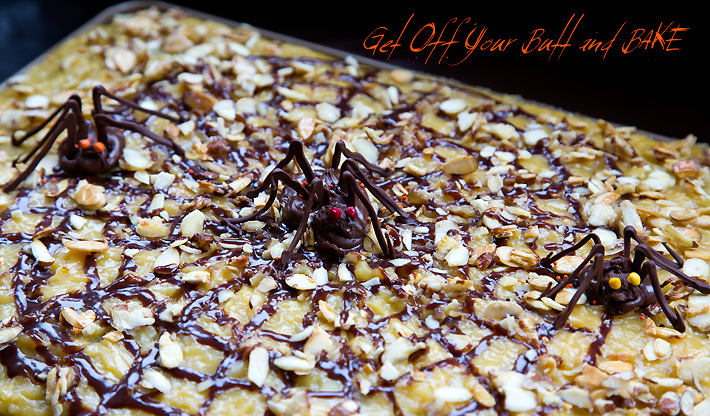 We even like German Chocolate Cake when it’s topped with Spiders! This cake isn’t anything fancy, but I wanted to “spook” it up a bit. I created a spider web in the center of the cake with chocolate ganache that I piped out. 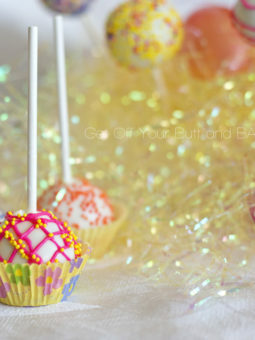 Take a toothpick, and gently cut through the chocolate to make the web effect. 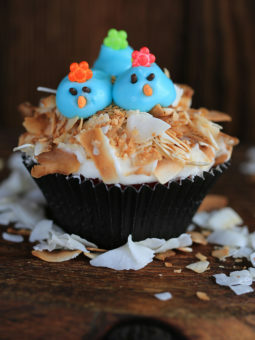 It’s kind of hard to see, because I piped it on top of the Coconut Caramel Frosting. 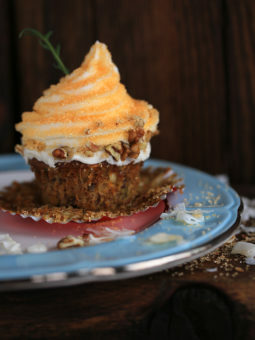 This cake is loaded with Glazed Almonds, since some of my daughters are “picky” about what nuts they will eat! 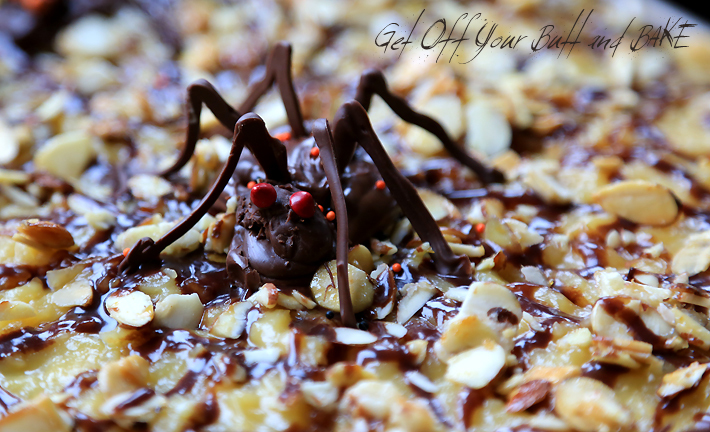 The spiders are created with melted Chocolate chips for the body, piped out with a round tip. 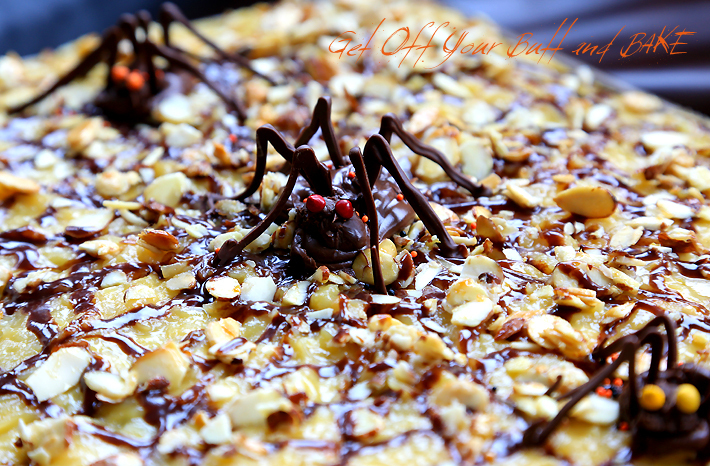 To create the spider legs, simply pipe the #7 shape onto parchment paper or a cookie sheet lined with a silpat. Place the cookie sheet of 7’s into the fridge until they are nice and firm #7’s. The short end of the 7 goes into the body, before the chocolate sets up! Make a few extra legs . . . in case you break a few. Sprinkles make up their beady little eyes. This cake is great with Pecans, hazelnuts, Walnuts or even glazed Almonds. Melt 1/3 cup of sugar in a heavy skillet or cast iron skillet, until lightly golden. Add 1 cup of nuts and stir until all the nuts are coated with the glaze. Spread out on parchment paper and let the nuts cool. 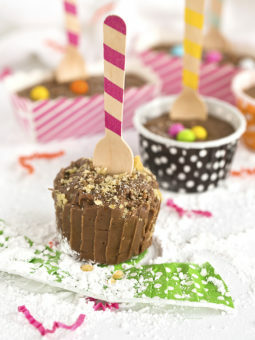 Sprinkle on top of cake before serving. 2 cups of semi sweet chocolate chips of other good chocolate cut into small pieces. Over medium high heat, place cream and butter. Bring cream and butter to a low simmer, but do not let the cream boil! Take off heat, and gently stir in the chocolate until it’s creamy and smooth. Let cool for about 2 hours, before using on cake.